Vacuum cleaners and lint rollers can help with cat hair on surfaces like furniture and clothing once it has already settled. But what about hair still floating in the air? How can you, a cat-owner, clean up the hair left behind from your little ones? No one I know would be willing to drag out a vacuum cleaner every day! The good thing is though, there’s a great solution: air purifiers. But do air purifiers really help with cat hair or is it all just some elaborate marketing scheme? My goal here is to give you straight facts and clear up this question once and for all. Do air purifiers help with cat hair? To get to the “long and short of it”, yes, they do…but with some trade offs. Air purifiers definitely can help trap cat hair floating in the air and reduce the overall amount of cat hair around you. However you need to understand that they aren’t capable of removing all of the cat hair where you need them to. The main benefit an air purifier can provide is that it can remove cat hair floating in the air before it settles on the surrounding surfaces and your clothes. With some additional features, a good one can also reduce cat allergies as well as odors. It can greatly improve the cleanliness and freshness of the air around you and reduce the discomfort (like sneezing) that comes with having indoor cats. It’s important to understand that none of them can remove cat hair that has already settled and has clung to furniture and other surfaces. Just like dust, cat hair will stay in the air a short time before settling. You’ll definitely still need to use a vacuum cleaner or lint roller. However, an air purifier can add a lot of relief and make a big difference in the air you breathe where your kitties live! To begin with, is it cat hair or cat dander that you need help with? Do you know the difference between the two? A lot of people may feel like they’re more or less the same thing but there’s definitely a big difference. In my early years, even I believed the myth that cat hair triggered cat allergies. But that’s all it is: a myth. Cat hair is literally just cat hair. It’s that irresistibly soft fur urging you to smother your cat in cute little scratches on kitty’s adorable little chin and back. Contrary to popular belief, cat hair is actually safe for those with cat allergies. A clean strand of cat fur will not induce any allergic reactions, even if you sniff it or touch it. On the other hand, cat dander is composed of a cat’s dead skin cells. Cat dander is the true culprit behind all those sneezes and sniffles people react with. Alongside cat urine and saliva, dander is one of the main triggers of cat allergies. Much like other contaminants, pet dander isn’t just on surfaces – it’s often airborne. Typcially it causes allergic reactions as it contacts your skin and enters your nose or respiratory passageways where it causes allergic reactions. The severity of how bad your allergies are varies from person to person. Did you know? It’s not just pet dander that affects your allergies. Dust mites feed off of human and pet skin cells and produce allergy-causing by-products. If you have allergies and you have pets, consider treating the dust mite problem as well. Dust mites cause allergic reactions and feed (and increase in number) from a supply of pet dander or human skin. There’s a good chance your allergies are due to this too. I’ve written a helpful post about dust mites and the allergy problems they cause here. 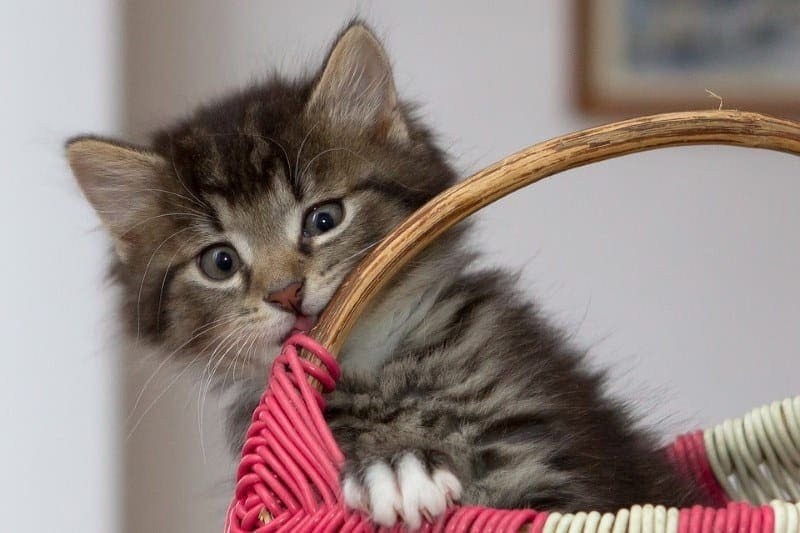 Don’t go around being careless about cat hairs just yet. While cat hair itself is harmless, cat dander and saliva can latch onto cat hair (especially since a cat grooms itself by licking). This is problematic for those allergic to cats as it’s easy for cat hair to attach itself and spread or just float around the air. Now that you know more it’s time to ask yourself it it’s cat hair or their dander you need help with – or both! High Efficiency Particulate Air (HEPA) filters are excellent filters and can permanently trap microscopic particles. A HEPA filter can trap particles down to 0.3 microns, or less than 1/1,000,000 of a meter! Did you know humans can only see up to 50-60 microns in size? That kind of filtration ability is more than enough to take care of all the hovering cat hair around your house. I’d also suggest a good vacuum cleaner with a HEPA filter or other filter (or bag) for cleaning carpets and furniture. This way, both air and solid surfaces are cared for. Your house won’t lack for cleanliness. Take it from a man who knows the pain of cleaning after a pet. 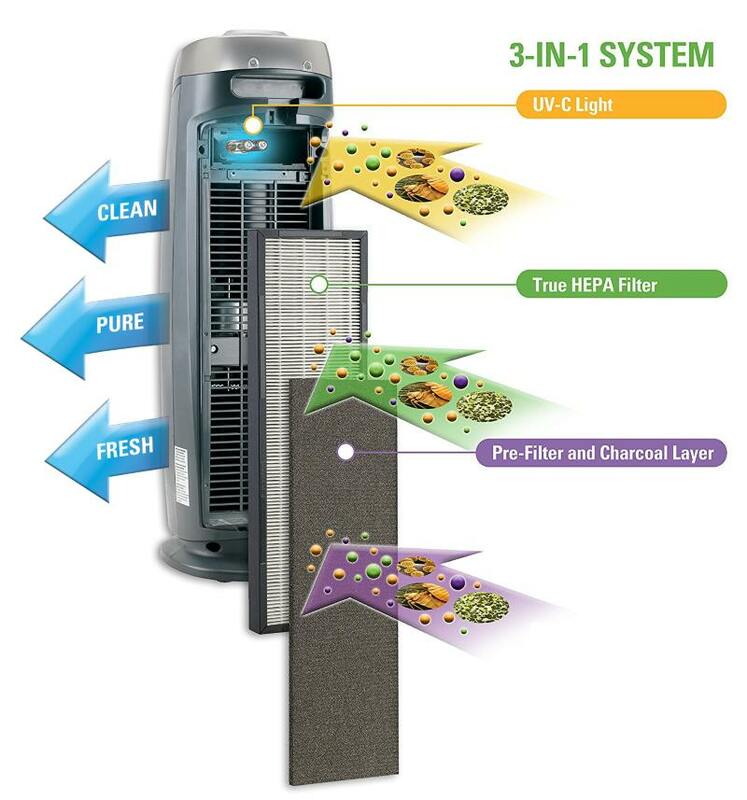 Ideally you should purchase an air purifier with a true HEPA filter and a pre-filter section. It’s also important to note that there’s a difference between a “HEPA-type” filter and a true HEPA filter. A true HEPA filter is able to trap particles that are larger than 0.3 microns in size, whereas HEPA “type” filters can only go so far as 2-4 microns. That’s an important distinction to be aware of. Note: It’s important to understand that many purifiers are indeed “true” HEPA filter types, which means they live up to the standardized filtration ability of 0.3 microns. Some products are sold as “HEPA type” – meaning they’re not quite as good. It’s a marketing tactic for lower-priced air purifiers I’ve seen at times. However, for cat hair, it’s not really a problem. It does become important if microscopic allergens like those from dust mites are an issue. A HEPA filter (white) is an EXCELLENT means of trapping and permanently removing sickness and allergy-causing foreign matter from you breathing air. They are made of very dense and super fine fibers which permanently trap almost all foreign materials in the air passing through them. 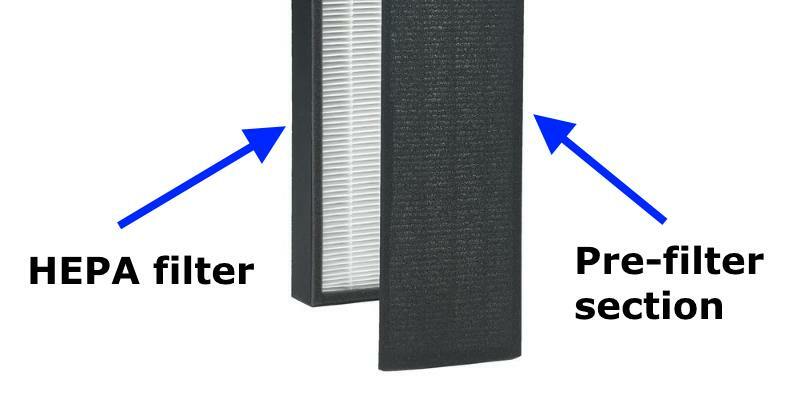 A pre-filter section (black) is a more coarse filter section used to catch larger particles like dust, cat hair, and more when dirty air enters the purifier. Note that many often include an activated carbon filter in this section as well. The biggest difference is that you will be able to trap cat dander and cat hair, but the resulting dust mite allergens which will be produced inevitably when you cat (or cats) have been residing with you for some time. It’s a problem that’s extremely common and must be deal with adequately. As an added bonus, a true HEPA filter is also capable of filtering out airborne particles such as viruses, bacteria, and allergens. Not only are you free from cat-induced sneezes and sniffles, the air around your home is also fresh and disease-free! Cat dander gets worse the older a cat gets. This is due to deteriorating health. Older cats are more susceptible to diseases which cause hormone imbalance. If your cat is living a long life and you notice your allergies worsen, perhaps it’s time to invest in an air purifier. Even if we potty train our cats to “do their business” in their little litter boxes, the smell still finds a way to linger. I was honestly blown away how much odor there was a few times after kitty did “went to potty” in a box of kitty litter – the smell was overwhelming! Maybe most people just get used to it, but unfortunately for me, I am not most people. With a sensitive nose like mine the smell can be distracting, inconvenient, and off-putting for certain house visitors too. To be honest, I kind of had to bite my tongue since I was a guest when that happened a few times. I’m pretty sure you know that feeling. The problem with air fresheners is that they can’t really address the source of the odor – they just address the symptom – the smell. In the end, I bought an air purifier with an activated carbon filter (useful against smells and chemical emissions) and a true HEPA filter. It’s helped a lot and there’s a good reason that carbon filters are used: they just plain work for reducing cat odors. If you’re interested I’ve made a great post about the best air purifier for pet dander here as they’re definitely very helpful for cat odors and hair as well. Why aren’t these filters mentioned as often if they’re so helpful? Eventually you’re going to start looking for the best air purifier in the market within your budget and you’ll run across words like: HEPA filter, carbon filter, ozone generator, ionizer, etc. The funny thing is that you won’t hear the words “pre-filter” mentioned very often. Why is that? They’re overlooked and often can be re-used without spending money on a FULL replacement (HEPA) filter, that’s why. Pre-filters are excellent for trapping thick pet fur and human hair. This way, HEPA filters and carbon filters can deal with those that pass through pre-filters: smaller particles (cat dander or smaller-than-average hair) and scents, respectively. Not only that, but it may be possible to clean and re-use pre-filters if you own a vacuum cleaner and if they’re mainly trapping hair like from you dog or cat, as it’s large enough to be removed with a strong vacuum cleaner. A pre-filter shown in a popular air purifier, the AC4825. The pre-filter also contains odor-trapping activated carbon. Additionally, the pre-filter, which also serves to filter out larger particles like cat hair can be replaced separately. This is really convenient feature for those who have odor & hair problems from pets. This particular model also offers a germ killing ultraviolet light (UV) feature. HEPA filters and carbon filters have limited lifespans, while pre-filters do not (most of them, at least). Pre-filters are ideal if you have a cat hair problem because they reduce the need to rely on the HEPA filter and can extend filter life. Most (again, not all) pre-filters can be washed and reused, hence their long lifespans. This avoids the main filter quickly being used up due to the accumulation of large particles. After all, HEPA filters are pricey, even more so with true HEPA filters. You can expect to pay around $30 or so for a replacement filter for many good-quality air purifiers. In some cases there are lower-cost 3rd party replacements, however. Of course, it’s not true for all manufacturers. It’s definitely important to be sure about what you’re buying before spending money. It’s a bit less common, but there are some air purifiers that are great for cat hair & odors like this model. It’s a small & lower priced model that can be cleaned with a vacuum to extend the filter life, without the need for a pre-filter section. I don’t want you to be mislead or spend too much money, so here’s another note. Some air purifiers sold allow cleaning the filter. This way you can avoid having to buy replacements as often. A great example is this great little pet air purifier from Hamilton which I really like. For only cat hair, a “true” HEPA or a “HEPA type” filter should work fine. A pre-filter or filter that can be cleaned is ideal. If you’re already in the market for an air purifier to help with cat hair, here’s a great buying guide with several excellent models with special features to help with pet issues. If you have several cats but don’t want to spend too much, you may want to consider a more powerful general purpose, best-selling air purifier like this one that can help you. You can read more helpful posts regarding air quality and air purifier topics on this page. Wow what a great load of information here! I had no idea that cat dander actually got worse the older a cat got and that dust mites also thrive around pets too…this is a greatly researched article! Do you find a huge difference between the cleanable air purifiers vs. the ones that you buy new filters for? I’ve been looking into getting an air purifier now that we have a baby in the house, but I’m really torn about which one to get. I don’t really like the idea of buying filter after filter because I tend to forget about things like that or let it go too long, and I know that can actually be worse (when there’s lots of gunk in the filter and it’s still running through the air)…so I’m just a bit more leaning towards the ones you clean because I’d be more likely to use it properly. Any thoughts? Hi Jaimee and thanks for the comment as well as dropping by! For example, if it’s a purifier like the Hamilton Beach, there’s no carbon filter or pre-filter. So you’ll lower filtering ability than one with those included. (Like trapping odors and catching hair in the 1st section before it gets to the HEPA filter). Although other brands & models don’t mention it, you can still vacuum off hair and dust, etc, from the pre-filter if you have one of those types. In that case you can extend it’s use. I vacuumed off dust that built up on my GermGuardian AC4825 recently. Several of the popular ones under $100 have a filter reminder built in. You may only need to actually replace the pre-filter if the HEPA filter isn’t completely clogged/dirty. So buying a 3-in-1 filter type where you can replace the pre-filter/carbon section separately is probably the best way to go usually. That will reduce filter replacement costs by close to 1/2. Most smaller air purifiers like the Hamilton don’t have a filter reminder so be aware of that. I can definitely recommend the GermGuardian AC4825. GermGuardian makes replacement filters for just the pre-filter section, so you won’t have to replace the HEPA filter for a long time.